HE DIED AT THE WEST LONDON HOSPITAL. TO "THE EVENING NEWS AND POST." 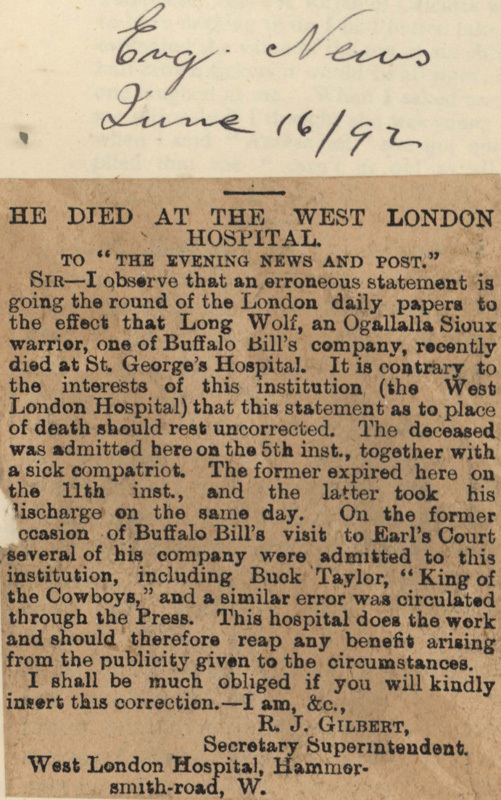 SIR—I observe that an erroneous statement is going the round of the London daily papers to the effect that Long Wolf, an Ogallalla Sioux warrior, one of Buffalo Bill's company, recently died at St. George's Hospital. It is contrary to the interests of this institution (the West London Hospital) that this statement as to place of death should rest uncorrected. The deceased was admitted here on the 5th inst., together with a sick compatriot. The former expired here on the 11th inst., and the latter took his discharge on the same day. 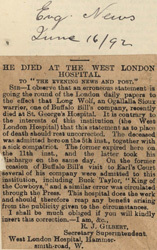 On the former occasion of Buffalo Bill's visit to Earl's Court several of his company were admitted to this institution, including Buck Taylor, "King of the Cowboys," and a similar error was circulated through the Press. This hospital does the work and should therefore reap any benefit arising from the publicity given to the circumstances.